Inspired by experiments planned in Rima Givot's chemistry class, four Sisters High School students submitted a proposal to the Asgard: Scientific Balloons for Space Education program. And for the second year in a row, a team from Sisters is one of 12 groups to be chosen from international submissions. Amy Hills traveled last year with 2018 graduate Ethan Ferwalt, so this is her second foray in this project. Her partners this year include junior Emma Farley, as well as fellow seniors Sydney Rawlins and McKenna Liddell. Their project has to do with testing how well different materials insulate, including Patagonia products, from consumer-grade material to what might be used in space. "Patagonia told us they truly want us to share our data with them," said Hills. "They said they do lots of testing but never up in near-space." Farley's mother and Hills' father are hoping to go along as chaperones. The students will stay in a student hostel with other participants, giving the students a true cultural experience as well as a scientific one. "It certainly will be fun for us to be housed with students from all over the world," said Liddell. The gathering at Sint-Pieterscollege in Brussels, Belgium takes place in April and the four-student team, along with the two chaperones, are making final preparations for the trip. The most pressing task before them currently is fundraising. The estimated total cost for each student is $2,000. Each team's experiment will go inside a small gondola attached to a hydrogen-filled balloon and launched into the Belgian sky. Trackers will chase the balloon down to retrieve its payload for the students to use for their data collection. Hills, the unofficial team leader, hopes for better luck this year. Last year's balloon drifted into Germany and some of GPS equipment failed as well. The balloon carrying the 12 experiments travels upwards as high as 30 kilometers (18 miles), which is considered near-space, where conditions are described as being similar to the surface of Mars, extremely cold and dry. Givot is thrilled for her students and appreciates their initiative to submit their proposal. "The Asgard Balloon project provides an opportunity for students to compete to participate in both a cultural and science experience," she said. "Students must first formulate a question and then design an experiment to test their question. Students who are selected spend the winter refining their question and design of their experiment. They then convene in Brussels in April to test their experiments. Through this experience they collaborate with students from around the world as they witness the launching of the balloon carrying their experiments. When the balloon is retrieved they analyze the data and report the conclusions to the group." Givot sees the project as having significant payback for the four girls as well as for other current and future students at Sisters High. "Our students will take their experiment to Brussels, and then return home to launch it a second time on the payload of our Sisters High School chemistry stratospheric balloon in early May," she explained. 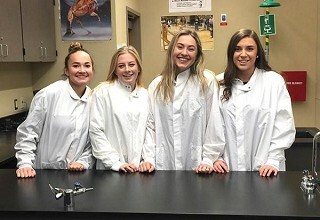 The Sisters High School chemistry students will work with Steven Petersen and other community mentors to design and build a payload and experiments to test, that they will launch as a team. The Asgard students will be able to compare the data they collect in Belgium with the data they collect here in Sisters. They will also have the opportunity to share their cultural experience with our students here in Sisters."